This series of columns is about my adventures in large format photography. And often, especially in this day of excellent 35mm digital cameras which can produce high resolution results, would anyone venture into the old style of photography? And with all the stuff you can do in photo editor these days, you think you can replicate every effect in large format photography, would anyone venture back into film photography, especially at $1.5-4.00 per exposure (sheet)? If that's your questions, then I think ye needs some lessons in what it's all about in large format photography, and what digital cameras and Photoshop can and can not do, and there will likely be some columns on those issues. But suffice it to say, large format photography isn't about digital, although there are some large format digital backs that knock the socks off any 35mm digital camera image. Back to the point of this column. I first became interested in large format photography hiking Mt. Rainier NP in the early 1990's. While hiking the Mazama	Ridge trail I came around a scene which I took photos with my 35mm film camera system, but taking the images it was clear no 35 film, and I'll say digital now, camera system can really do justice with the scene. There is simply a lot to photograph and present. That started the interest to explore the idea of getting into 4x5. But as with everything we do, life gets in the way of a lot ideas, and this was postponed until 2003 when I explored post-retirement plans in photography, projected then to be 2008. I decided to explore it and see what's possible with learning and doing large format photography to be ready for retirement. Being a research reader, I found the books and on-line resources and piled up stacks of reading material. I spent the next year-plus reading about cameras, equipment, film, field techniques, and on and on about every aspect of it. It's extremely daunting, but if you break it down into components, it's learnable and doable. The biggest factor in starting is the learning curve. It's huge, generally about 2-3 years just to understand the basics. You're not learning a camera where you point and shoot. 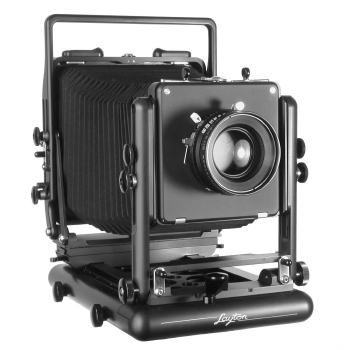 Learning large format photography is the integration of the photographer and the camera. The on/off switch is your brain and mind. Nothing happens you don't think and do. With the exception of some of the digital backs and cameras (eg. Sinar), there's no electronics. You're where all those before you have been, standing with the camera going, "Ok." And so the adventure begins.